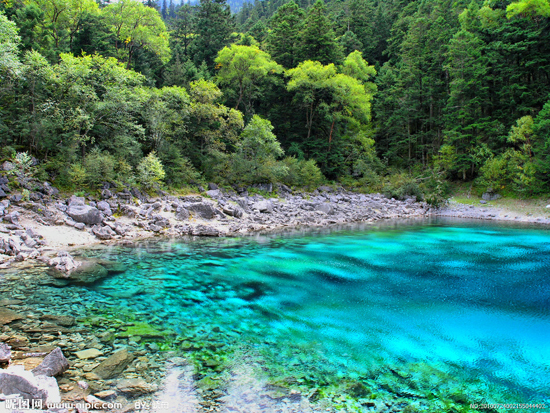 Jiuzhaigou Valley is a nature reserve and national park located in the northern part of Sichuan Province. It is part of the Minshan Mountain range on the edge of the Tibetan Himalayan Plateau, extending over 72,000 hectares. A branch of the Baihe River, the upper stream of Baishuigou Valley, Jiuzhaigou Valley was named after the nine Tibetan villages located along its length. With an elevation ranging from 2,000 m to 4,500 m, the valley is covered by primary forests and 108 lakes. It is known for its crystal lakes, multi-level waterfalls, colorful forests, snow-capped peaks and Tibetan culture. Over 140 types of birds can be found in the valley, together with many other kinds of endangered animals and plants, including pandas and Sichuan Takins. Thanks to its beautiful landscape, Jiuzhaigou Valley has been branded a "fairytale world" and a "fairyland on earth." In 1992, UNESCO put the area on its World Heritage Site List and in 1997 named it a World Biosphere Reserve.